This is my second Jasmine blouse. The first sleeveless version can be seen here : Sleeveless Jasmine. 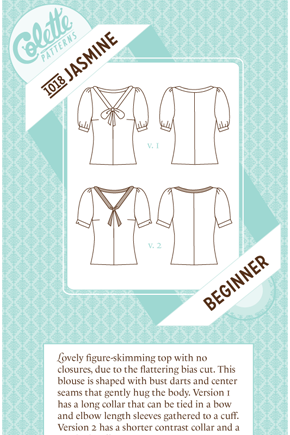 The Jasmine blouse from Colette Patterns, is cut on the bias with bust darts and center front and back seams. 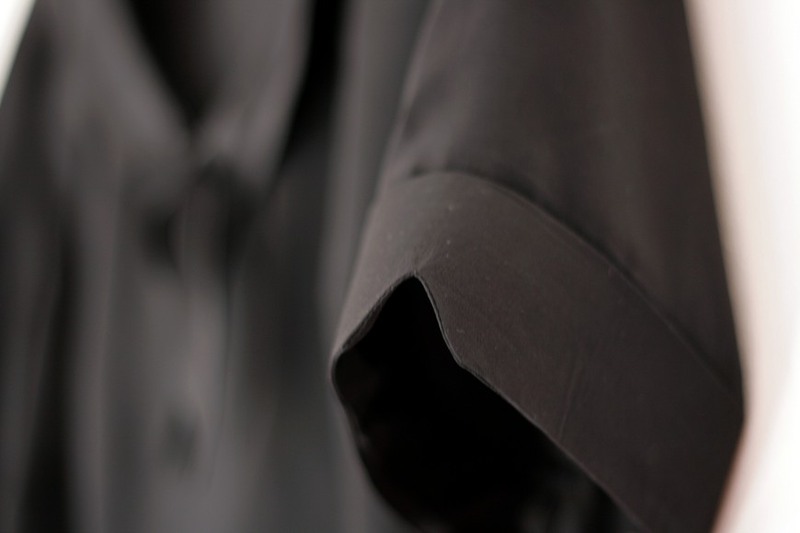 The pattern offers variations of sleeves and collars. I sewed version #2, the one with the shorter collar and, this time, with sleeves. 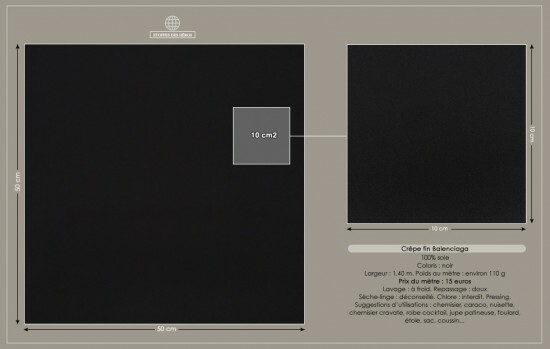 A beautiful Balenciaga fine black silk crepe, purchased from Étoffes des héros. Ma-gni-fi-que ! Fluid and light, a joy to wear ! But a horror to cut… Well that was to be expected with silk crepe : sliding in every directions and trying to escape from the table at every opportunity. I managed by cutting through a single thickness (that’s what’s instructed in the pattern anyway for front et back pieces) and spreading the fabric over my cutting mat. To cut I used my rotary cutter to move the fabric as little as possible. 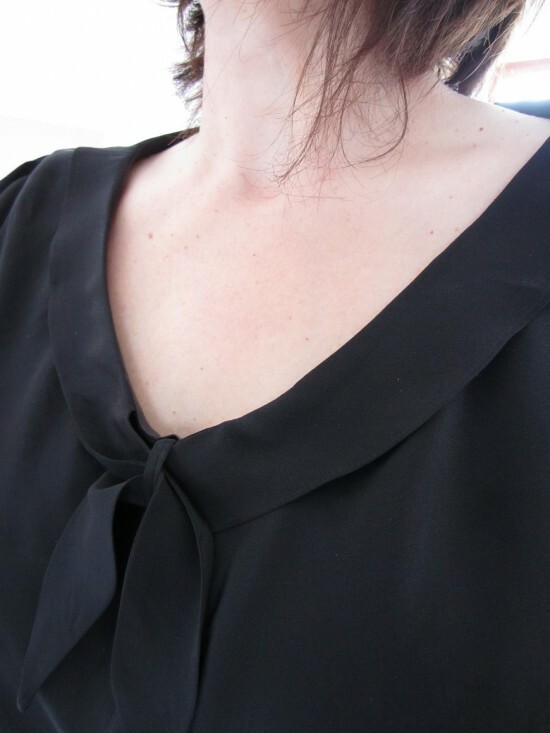 As with my previous blouse, I raised the bust darts by 1cm (3/8″). As I had already made the changes on the paper pattern the first time, it was ready for this blouse, yay! 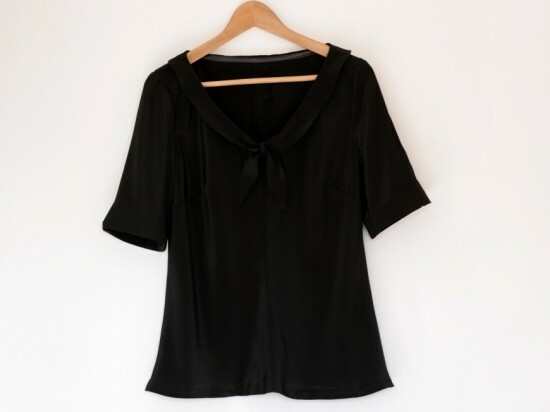 Like for my first Jasmine, I replaced the neckline facings with a bias binding to finish the neckline seam. I’m not a big fan of facings and this technique is a good alternative in this particular case. I used the same tutorial as for my sleeveless Jasmine : Jasmine bias bound neckline on “My Messings” blog. Interface the back collar pieces because the collar is wavy every time and it’s bugging me ! Aesthetically I find the sleeves cuffs too big on version #2, arms “float” inside, so next time I should reduce the length of the cuffs and gather the lower edge of the sleeve to match OR mix the views : the short collar from version #2 with the sleeves from version #1. I’m really disappointed with the photos! 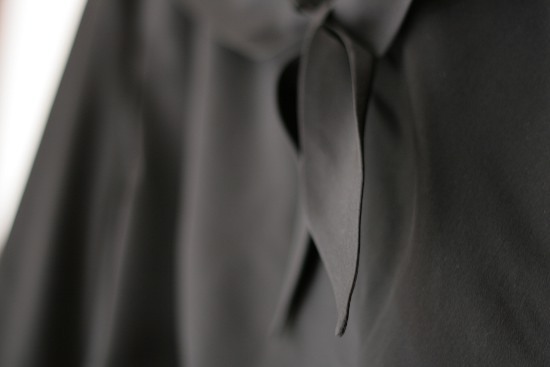 Black AND silk I already find difficult to take good pics of and… I’m no pro. The blouse is 100 times better in real life, I swear! Just a little peek at the skirt ! 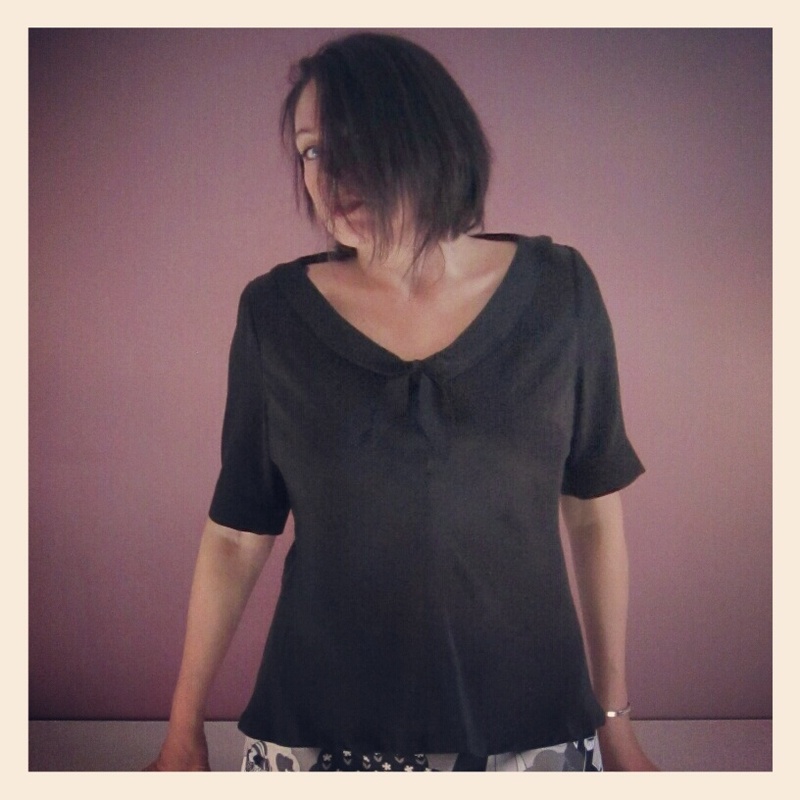 This entry was posted in Blog, Clothes, Sewing Projects and tagged Colette by Véro. Bookmark the permalink. This is really pretty. 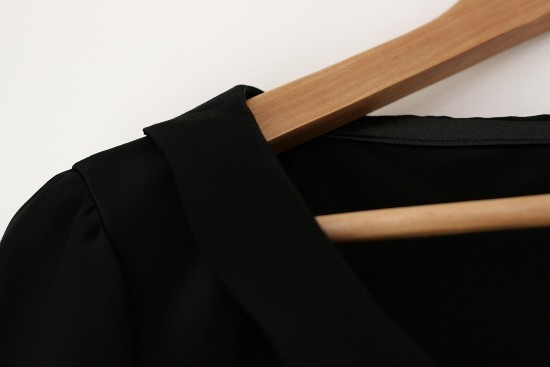 The sleeve detailing is gorgeous. 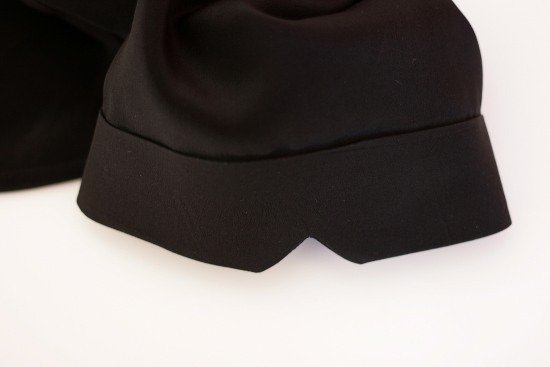 Yes, that’s what I love about Colette Patterns : nice refined details !